First I want to mention regarding the skills, they are available besides the learn action to read what they are (I couldn't fit the skill information and explain that you need to take a turn to learn it etc within the same thing, so I have them besides eachother). If I were to have more time with it I'd like to add an initial character selection screen that includes the full detail of their skill/power actions too before the battle. As this was a solo project within the months time, and the majority of that time was spent just getting the systems working, regrettably I didn't get to have any smoother learning curve between the tutorial boss and the boss itself. Ideally of course I'd like to have more Boss's inbetween/after it, but I made sure I could consistently beat it-while recognizing that I knew the battle inside and out, before I felt the challenge was likely right-while expecting a new player to need 1+ attempts before beating it. I also hoped to ease their progression between battles by having the few ranks I was able to implement there to add at least some feeling of progress. The reason the cheer and skill learning is taken from the same pool is for you to try and balance the opportunity between learning new skills and recovering, if they were separate pools it would feel redundant. Though if I end up investing in the project more I may try to adjust the pacing and reduce the cheering to 2 given your feedback, and that there's already the overlapping limitation that you need to defeat a new enemy to use that/take your turn using it. It would depend on how the new boss's/enemies affect the current mechanics/pace. I did a lot of retesting for this and had to go with what felt like the right balance at the time while leaving me the wiggle room to finish everything else, but I wouldn't doubt this could be improved more so thanks for voicing your thoughts about it (e.g. 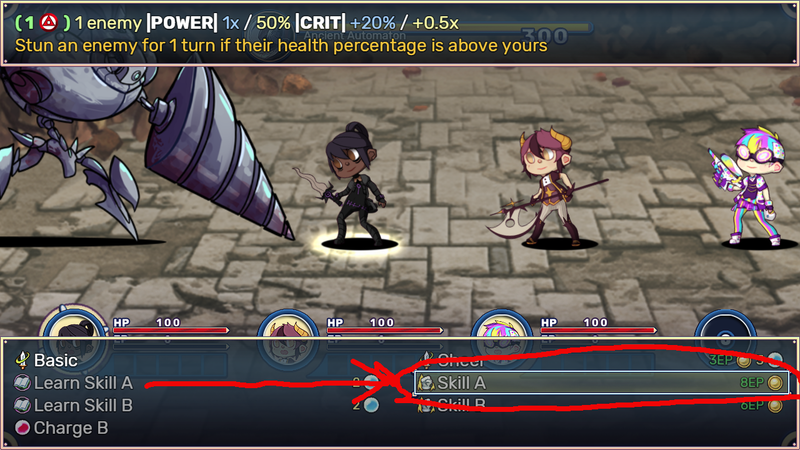 I tried to make the B skills easier to achieve but I might want to tweak them more too, like automatically giving you a charge each time the character cheers). The boss battle is meant to be a longer than standard journey from start to finish while you try to take advantage of weaknesses you might discover (not exactly, but think Shadows of the Colossus if you know of that game-a journey to defeat the boss), (e.g. if you activate it in the right way when its mindset is at the left/right side [the green side] it will end up short-circuiting giving you extra room for damage/delaying monster spawning). Of course though it may have felt more natural if there had been stepping stones before this boss. If I have enough interest to develop more boss's I may split long/short battles between their own categories so it's more understood what challenge you're participating in. Thanks a lot for trying it out and sharing your impressions :), hopefully it may evolve into a project you can enjoy more in the future. If I may suggest a previous project that might already be closer to something you'd enjoy - https://forums.rpgmakerweb.com/index.php?threads/phernil-academy-use-knowledge-a... - of course it's up to you though, just thought I'd share it :). And there's a few videos of it to quickly see if it may interest you. Again thanks so much for playing and taking the time to respond :). Ohh I could definitely do that for the skills, and no worries about taking a turn to read them-I know an instant cast trick that means it won't cost a turn, that's what I use for the Journal in the battle menu :D. I can create an action below the Journal, 'Skill List', that will let you read through your characters skills. Happy to hear you like the idea for the separate Boss category too. Yeah I certainly agree that it could use some more battles before it, or scaling back its difficulty to have more difficult difficult Boss's after it instead would be nice. Maybe even a rematch with a stronger Slime King with a full set of slime battlers would immediately work well for that. I hoped that keeping the tutorial boss as interactive as it was but an easier challenge could help reduce new players frustration when reaching the single Boss's intended challenge. It was a difficult judgement on how to scale its difficulty when I both wanted to make it a challenge to overcome, as too easy a Boss when it's the only one could leave you without any sense of accomplishment, but too hard would definitely lead to that frustration. Hopefully it's not so daunting that players who didn't defeat it wouldn't be willing to come back for other in-between challenge levels later. Thank you so very much for your words of encouragement towards the project, I'll do my best for sure :)!